Help, I’ve found a bat! Find a small container such as a shoe box or ice cream tub. Punch a few very small holes (smaller than the diameter of a pencil) in the lid if it is a plastic container. Place a cloth screwed up in the bottom of the box for the bat to hide in. 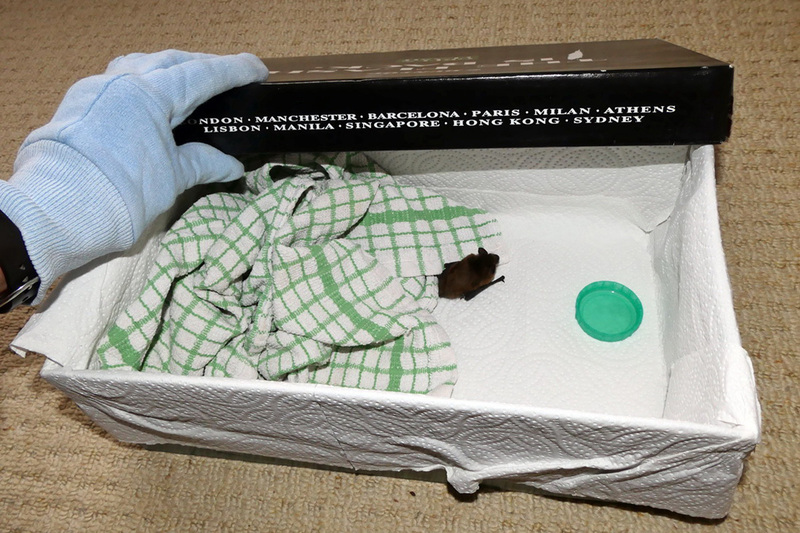 Place a milk bottle cap or other shallow lid in the box, away from the cloth, with a few drops of water (not enough for the bat to drown in). Gently pick up the bat, wearing gloves or by scooping it with a cloth. Place it in the box. Do not handle it with bare hands. Make sure the lid is on securely as bats can escape through very small gaps or holes. Keep the box indoors in a quiet place away from pets. 2) Phone the Bat Helpline on 0345 1300 228 to find the nearest bat carer. 3) If the helpline is closed and you are unable to reach a carer we recommend taking the bat to a local vet or wildlife hospital, or contacting the RSPCA National Helpline on 0300 1234 999. 4) It is really important that we know the area that the bat was found so that once it’s fit we can release it somewhere that it knows so that it can return to its roost (many bats live in groups with their relatives). Always pass on your contact details to the carer or vet staff. Why do bats sometimes need our care? Cats can hear bat echolocation calls. They often climb onto roofs or walls to get closer to bats as they emerge from their roosts and swipe them with their paws. They also jump up into the air to catch low flying bats. Their sharp claws can tear the bats wing membrane and break their delicate bones. The claws and teeth carry lots of bacteria which can cause a fatal infection in the bat. Sadly many bats injured by cats die or have to be put to sleep as they are too badly injured to recover. How can you help? Bring your cat indoors half an hour before sunset and ideally keep it in all night from April to October when bats are active. Insect numbers in the UK have declined in recent years. Sometimes bats struggle to find enough insects to eat, particularly when the weather is bad. Flying is a very energy intensive way to get about and so starving bats often become grounded, a bit like a car that has run out of petrol. Once on the ground they are vulnerable to attack by predators such as cats. A few days of rest, rehydration and feeding with an experienced bat carer may be all that is needed to get them fit to return to the wild. Sticky fly paper is often hung in lofts or sheds where bats may roost. 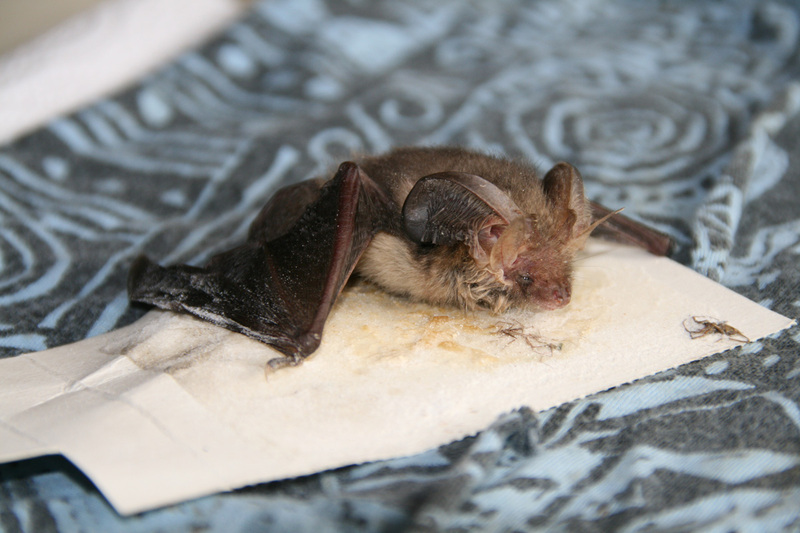 Bats are attracted to the noise of the distressed insects stuck on the fly paper and can get stuck to it themselves trying to catch the insects. Distress calls from one bat may attract further bats. If not found quickly the bats soon get exhausted and die from dehydration and starvation. Bats flying along roads may be hit by cars. One pregnant female bat travelled several miles clinging to the grille on the front of a car before being rescued. 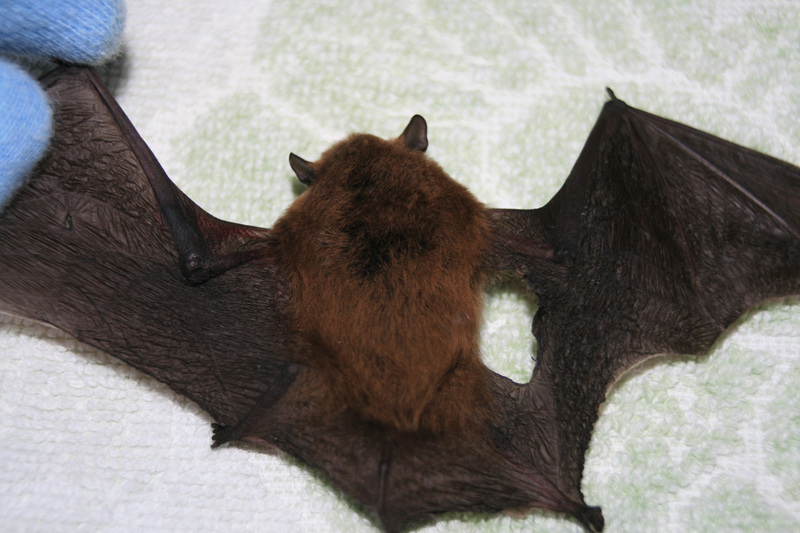 As some bat species roost in houses they can be injured during building work, such as removing roof tiles or weather boards. Bats usually give birth to one pup per year, in June or July. If the mother is killed or injured and can’t return to breast feed her pup it may go looking for her and be found on the wall of a house or on the doorstep. Sometimes the pups are just curious and get themselves lost and we try to reunite them with their mother in the evening. Juvenile bats have to learn to fly and catch insects by following other bats from their roost to practise their skills. Sometimes they crash or get left behind and can’t remember the way home.